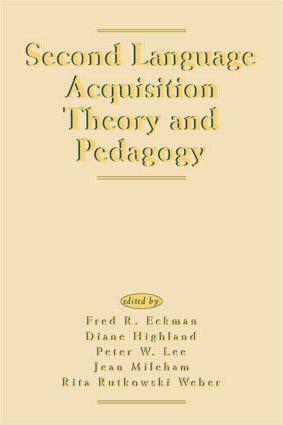 A volume on second-language acquisition theory and pedagogy is, at the same time, a mark of progress and a bit of an anomaly. The progress is shown by the fact that the two disciplines have established themselves as areas of study not only distinct from each other, but also different from linguistic theory. This was not always the case, at least not in the United States. The anomaly results from the fact that this book deals with the relationship between L2 theory and pedagogy despite the conclusion that there is currently no widely-accepted theory of SLA. * discuss issues surrounding the teaching of pronunciation factors that affect a non-native accent. "…this volume is worth reading. Insight into the debate surrounding some of Krashen's theories will certainly add perspective that is badly needed in the teaching profession. But most useful is the advice of those who, with one foot in the classroom, can keep researchers on task, and foster more genuine dialogue. Teachers cannot, and must not, turn their backs on this responsibility." "This volume is well organized, with strong articles at the beginning of each section; I heartily recommend it….There are a number of excellent and applicable articles within that offer material and incentive for the building of a navigable bridge between L2 theory and practice." Contents: F.R. Eckman, Preface. Part I:Factors Affecting the L2 Setting. S.M. Gass, Learning and Teaching: The Necessary Intersection. L. Schinke-Llano, Reenvisioning the Second Language Classroom: A Vygotskian Approach. A.J. Hastings, The FOCAL SKILLS Approach: An Assessment. S. Flynn, G. Martohardjono, Toward Theory-Driven Language Pedagogy. Part II:Input: Internal Factors. L. White, Input, Triggers, and Second Language Acquisition: Can Binding Be Taught? J.L.S. Bruhn-Garavito, L2 Acquisition of Verb Complementation and Binding Principle B. R.L. Hamilton, The Noun Phrase Accessibility Hierarchy in SLA: Determining the Basis for Its Developmental Effects. K.C. Croteau, Second Language Acquisition of Relative Clause Structures by Learners of Italian. Part III:Input: External Factors. D. Larsen-Freeman, On the Teaching and Learning of Grammar: Challenging the Myths. K. Bardovi-Harlig, The Interaction of Pedagogy and Natural Sequences in the Acquisition of Tense and Aspect. B. VanPatten, C. Sanz, From Input to Output: Processing Instruction and Communicative Tasks. S.D. Krashen, Free Voluntary Reading: Linguistic and Affective Arguments and Some New Applications. A.A. Ciccone, Teaching with Authentic Video: Theory and Practice. Part IV:Output: Factors Affecting Production. A.D. Cohen, SLA Theory and Pedagogy: Some Research Issues. J.E. Parker, S.M. Heitzman, A.M. Fjerstad, L.M. Babbs, A.D. Cohen, Exploring the Role of Foreign Language in Immersion Education. E. Tarone, A Variationist Framework for SLA Research: Examples and Pedagogical Insights. Part V:Output: Pronunciation. J.C. Paolillo, Markedness in the Acquisition of English /r/ and /l/. R.M. Hammond, Foreign Accent and Phonetic Interference: The Application of Linguistic Research to the Teaching of Second Language Pronunciation. D. Hansen, A Study of the Effect of the Acculturation Model on Second Language Acquisition.